Tip: The more plants in your lawn, the less you need to water it, the less the soil erodes, the less fertilizer and chemicals are needed, and the more time there is to enjoy your attractive lawn. 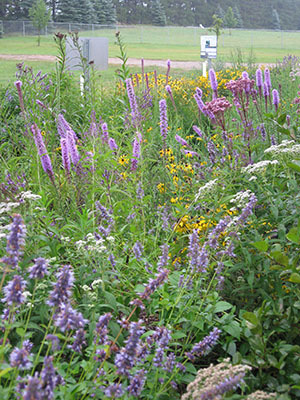 Native plants require less upkeep and chemicals, and provide better habitat for wildlife. (Learn more about this clean water tip). OPEN What is a Watershed? OPEN What is a Watershed District? A watershed district is a unit of government that is based on the natural boundary of a watershed. The Minnesota Watershed District Act was implemented in 1955. It allowed for the establishment of local units of government, such as watershed districts or water management organizations, to protect and manage water resources based on hydrologic boundaries rather than political boundaries. Because it relies on the natural boundary of the watershed, a watershed district could include all or part of a number of cities, townships and counties. Runoff is the water that flows over the surface of the land, a building or road downstream to a lake, wetland or stream. Before the land was altered, much of the water that fell on it soaked directly into the ground. That water either fed grass, plants, and trees, replenished ground water sources, or was discharged to lakes, wetlands and streams. As we farmed the land and built our cities, we re-routed the runoff by creating ditches, stormwater pipes and culverts. As a result, the runoff drains directly into our local lakes, wetlands and streams, therefore, overwhelming many of our water bodies today.